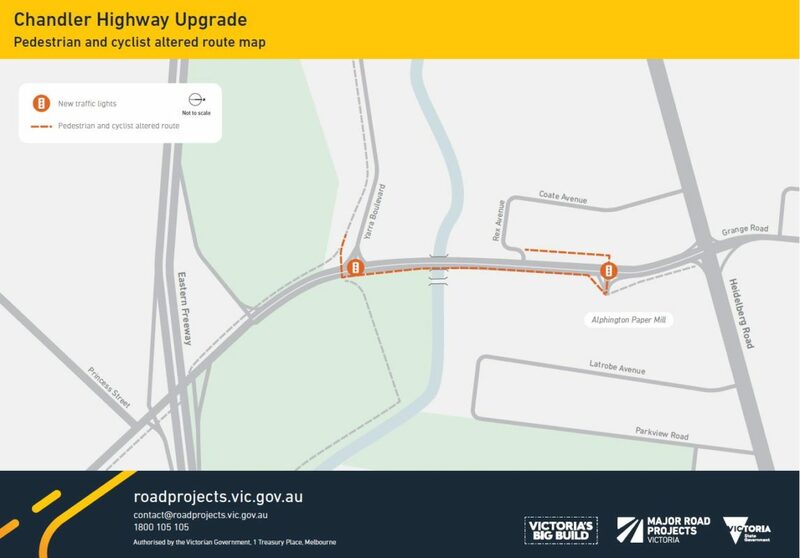 A detour at the end of the Kew Boulevard that asked riders to cross the Chandler Highway using pedestrian lights at the Eastern Freeway will be removed as work on the new Chandler Highway bridge progresses. New traffic lights at the intersection of the Boulevard and Chandler Highway are about to be switched on. It will include a signalised pedestrian crossing connecting to the Main Yarra Trail. Bike riders and pedestrians aren't yet able to use the old Heritage Bridge crossing the Yarra River next to the Chandler Highway, so a temporary detour is being put in place to direct people to the eastern side of the new bridge. Click here for a map of the detour or see the below image. The Main Yarra Trail under the Chandler Highway bridge, including the stairs, will also be closed and a detour in place from 31 January 2019. The detour will use the Yarra Boulevard pedestrian crossing. The closure and detour will be active until the middle of the year. Any questions can be directed to the project team on 1800 105 105 or contact@roadprojects.vic.gov.au.